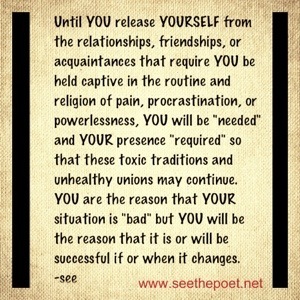 Until YOU release YOURSELF from the relationships, friendships, or acquaintances that require YOU be held captive in the routine and religion of pain, procrastination, or powerlessness, YOU will be “needed” and YOUR presence “required” so that these toxic traditions and unhealthy unions may continue. YOU are the reason that YOUR situation is “bad” but YOU will be the reason that it is or will be successful if or when it changes. This entry was posted in Uncategorized and tagged Drive, Hope, Inspiration, Motivation, Perspective, seethepoet, Truth on August 1, 2013 by seethepoet.